Friday, June 19, 2015 – New York City’s packed landscape of skyscrapers and apartment buildings, however distant from the more traditional imagery of ritual grounds, is nonetheless Shaman Mama Donna’s environment of choice for her practice. At weddings, office blessings, or seasonal festivals, Donna Henes is hard to miss thanks to her fiery red hair and bright robes. From afar, one can catch a glimpse of orange or a flash of blue as she flutters between audience members. That being said, even harder to miss is her crowd’s energy. As an urban shaman and ceremonialist, Donna Henes seeks to connect everyday people to a spiritual realm beyond taxi cabs and subways. “I see it as my assignment from the universe,” Henes says of performing rituals around the globe. Her work, which spans across the past forty years, does not create a separation between performer and viewer. She sees a ritual as successful only if every person in the group actively participates and relates with the event at hand. The Summer Solstice takes place every June 21st: as the first day of summer and the longest day of the year, it is a natural occurrence that deserves a ritual to match its significance. 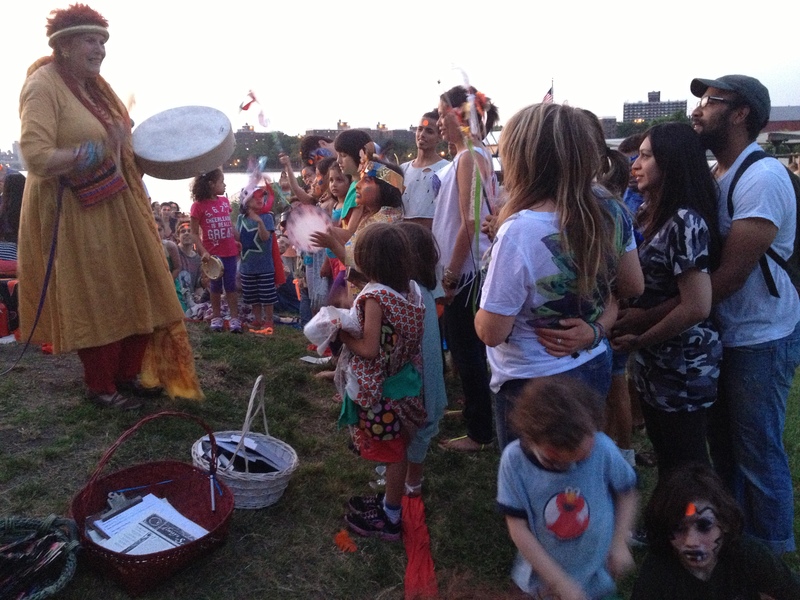 Henes has played a major role in many of New York City’s Summer Solstice festivals, and for over ten years, Henes has celebrated this day with Socrates Sculpture Park during our annual Summer Solstice Celebration. Within that amount of time, Henes has inevitably collected an innumerable amount of experiences at each year’s celebration. She recalls an event from seven years ago, in which a young couple became engaged during her ceremony at Socrates. She was later asked to officiate their wedding, and was recently contacted to bless their new home. This Sunday the 21st, Henes will start her Summer Solstice ceremony at Socrates as the sun embarks on its descent over the Manhattan skyline. From spraying blessing water to passing out neon stickers, Henes is playful in her approach. The stickers, which symbolize the energy of the sun, act as reminders that as days begin to shorten, each individual must continue to carry around that energy for one another throughout the colder months.